1 Nanotesla (0.01 milligauss) Resolution in ±100,000 Nanotesla (1 Gauss) Full Scale Range. ±0.25% Basic Accuracy Traceable to NIST. Simultaneous Display of the Three Vector Components. Operator Selectable Field Units (nanotesla, microtesla or milligauss). Operator Selectable Vector Coordinate System (Rectangular or Polar). Absolute or Relative Display Modes. Two Analog Outputs per Axis. Three Data Storage Modes: Snapshot (7.5 s), Record (30 s) and Manual. 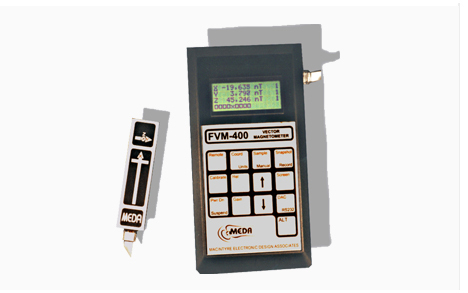 The FVM400 uses fluxgate technology to measure the three vector components of the magnetic field. The fluxgate sensors are packaged in a 1" square by 4" long probe that is connected to the handheld electronics unit by a modular telephone cord. The sensor can be located up to 100 feet from the electronics unit. In the Rectangular Coordinates mode, the FVM400 displays the thee components of the magnetic field vector. In the Polar Coordinates mode, the FVM400 displays the magnitude and direction of the field vector. Click here to download the FVM400 Instruction Manual for more information. You can remotely control the FVM400 through an RS232 connection to a serial port of a computer. Supplied with the FVM400 is the FM300 Front Panel© software package. This package includes the FM300 Front Panel program and the FM300 Network Server. Control all the FVM400 functions. Download the FVM400 data stored in its internal buffer. Strip chart FVM400 data in real time. Save data to a text file for later retrieval or for further processing by, for example, a spreadsheet program like Microsoft Excel. Download the User's Manual for a complete description of the FM300 Front Panel program. Continuously log FVM400 data to a file. Make data available to multiple users over the Internet. Control FVM400 functions over the Internet. Download the User's Manual for a complete description of the FM300 Network Server program.